As anyone who looks at this regularly must know, I have gone off blogging a bit – it suddenly seemed to be an ego-trip too far. But I have just popped in because – as my helpful son points out – it just daft to miss the opportunity to flag my new book ‘Gardening in Pyjamas’, which will be officially available from April 11, published by Simon & Schuster , RRP £12.99 – less on Amazon, of course). Essentially it is a complete re-vamp and up-date of ‘Gardening in Your Nightie’, which I wrote in 2000. A modest book of words that pre-dated my Thorny Problems page in the Telegraph, ‘Nightie’, hit the spot for a lot of gardeners – those keen enough, daft enough, to get out there in all weather first thing in the morning (usually inappropriately dressed, hence the title) but didn’t quite know what to get on with and how to go about it – and why. ‘Pyjamas’ is updated to deflect criticisms about sexism, reflect 21st century wardrobe refinements and, more importantly, modern ‘greener’ gardening habits. It’s got no glamorous pictures, no ‘helpful’ pruning diagrams, minimal mumbo-jumbo, Latin and science. And, of course, the new book also benefits considerably from 12 more years of my own experience as a gardener and writer. I’m really proud of it, and I hope you like it. This entry was posted on Friday, March 22nd, 2013 at 2:13 pm and is filed under Musings. You can follow any responses to this entry through the RSS 2.0 feed. You can leave a response, or trackback from your own site. 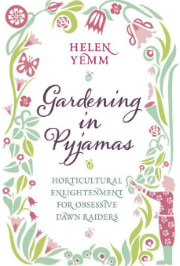 5 Responses to ‘Gardening in Pyjamas’, anyone? And it’s got a very pretty cover! I’d love to write a review of it. Do you know how I can request a review copy? This looks fab! I hope the title isn’t a metaphor! I have been know myself to be spotted by the husband, donned in checked pj bottoms with a morning cuppa pulling out a few stray weeds! Can’t beat a bit if spontaneous gardening! On my headstone will be ‘she loved to garden in her nightie’…..oft found wafting around the garden in Surrey in full length not-so-white linen with a pair of garden clogs almost til lunchtime…..but here in Oman where I spend most of the year outside of the searing summer months it’s a case of cover up a bit and dodge the sun. The locals think I am totally barmy doing it myself but I keep us in daily salads and tomatoes through the winter months and have a herb collection even better than the one in England. Can’t wait to get back ‘home’ to begin renovation project following house extension great reason to look afresh at the garden. 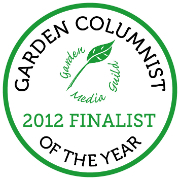 Love your column Helen, a little bit of home as well as your advice is gratefully received each week.